Dr. René Fasel was elected IIHF President in June 1994 at the Congress in Venice. The dentist, who was born on 6 February 1950 in Fribourg, Switzerland, started as an amateur player and eventually advanced to international referee and then to an official in various functions. René Fasel played for HC Fribourg-Gottéron in the amateur division and in the National League B. 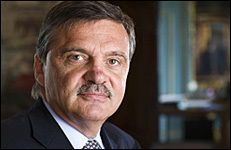 He was re-elected for a fourth term as IIHF President at the IIHF General Congress in Montreal, Quebec, Canada, in May 2008. As a referee, he went up to the top division and officiated 37 international games. In 1985, the dentist with the gift for languages became the key figure as president of the Swiss Ice Hockey Association and in 1986 he joined the leadership of the world federation after his election as IIHF Council member. Fasel was the chairman for both the Referee and the Marketing Committees of the IIHF. At home, the honorary member of HC Fribourg-Gottéron resigned from all his functions in order to fully devote himself to his international duties. When Fasel became Dr Sabetzki's successor as IIHF President, the world federation steeped in tradition entered a new era. The new president was anxious to establish a closer contact with the professional organizations in North America and consolidated the relations between the IIHF and the NHL. After all, it is thanks to Fasel's endeavours that in 1998 the NHL’s top professional players competed for the first time at the Olympic Winter Games in Nagano, Japan. In June 1995, Fasel was appointed, as the very first ice hockey representative in history, to the International Olympic Committee (IOC). Consequently, the IIHF President raised the stature of ice hockey enormously. The integration of In-Line Hockey into the IIHF and the foundation of the European Hockey League were some long-sighted projects that were successfully realized during Fasel's presidency. In 1997, Fasel was commissioned by the IOC to compile a study on the dental treatment of Olympic athletes at the University of Barcelona. He earned his doctor's degree for his impressive work in 2008. Fasel has been serving as the president of the Association of the International Olympic Winter Sports Federations (AIOWF) since 2002. He was also named the chairman of the 2010 Vancouver Olympics Co-ordination Committee. He is currently a member of the Coordination Commission for Sochi 2014. Most recently, Fasel was elected onto the IOC Executive Board for a four-year term during the 120th IOC Session in Beijing on August 7, 2008, as the winter sports representative. The executive board is the highest body within the IOC and assumes the ultimate responsibility for the administration of the IOC. In 2004, Fasel was given the prestigious Legion of Honour Award, which is the highest award given by the French Republic for outstanding service to France, regardless of the nationality of the recipient. Also in 2004, Fasel was awarded the Ukrainian VIZHIBU prize for significant contribution to the development and popularization of ice hockey around the world. In 2008, Fasel received the Special Award of the Swiss Association at their Centennial Gala, which honours personalities for extraordinary contributions to Swiss ice hockey. By the prestigious Sport Intern Newsletter, Fasel was listed as the 13th most influential sports personality of 2003. He is also a member of the Hockey Hall of Fame board.